In northern Thailand, especially in the area around Chiang Mai are infinitely many cultural riches. The area is also famous for its craft traditions. To Chiang Mi you can travel if you want to try out the elephant riding at a level higher than the traditional tourist traps down in southern Thailand. Take the opportunity to meet the indigenous people, mountain people! Take the opportunity to take a ride on a raft in one of the many rivers. Tourist flows to Chiang Mai has expanded in recent years and has become a city of strong growth, the city is located 700 km north of the capital Bangkok, and is situated on the banks of the Ping River. Around the city of Chiang Mai is the beautiful forested mountains. The history of the city stretches back as far back as the Siamese origin. These kingdoms have shaped the city and Chiang Mai still offers huge beautiful old temple from the early 1200's. The style of the temples are north Thai and or Burmese. 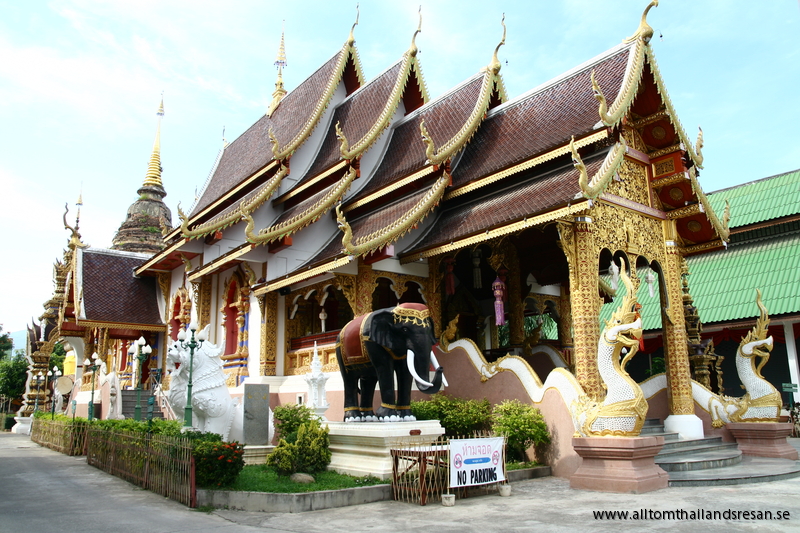 You will find around 300 different temples around the city of Chiang Mai. In the past, you arrived to the city on elephant back or by river. These modes of transportations was replaced in 1920 by the northern train from Bangkok. This made the city less isolated, but the city remained more or less intact until the mid-1970s when tourists began to discover the amazing city and growth accelerated considerably. Chiang Mai is famous for its wonderful craftsmanship and is a global center for the cotton industry. Should you shop, the range of crafts is big and you can buy woven cotton clothes, bags and fabric etc. Most of the clothes sold in the city are made in villages around and returned to the city to be sold. There are also beautiful wood carvings and beautiful statues, Thai silk and hand painted umbrellas, kermik and more. Chiang Mai is known to still preserve the craft traditions instead of letting industrial products take over more and more of the work. Chiang Mai was founded in 1296 by King Mengrai for his rapidly growing kingdom of Lanna Thai Already in 1256 he had the prince gathered many of the small mountain people around him, after his father's death he took over the throne and the crown, and in 1262 he built a new capital for the new country "Anachak Lanna Tai" in Chaing Rai but in 1291 he decided to move the capital to the south and the choice fell on the spot where Chiang Mai is located today. Chiang Mai has a cooler, more comfortable climate than what the rest of the country offer. During the cold season, or you're out on the mountain hiking or similar is recommended to put on something warm. The coldest period is during October to March with an average temperature of 21 + degrees At night, it is not at all unusual to temeraturen drops down to 0. Wat Phra Singh, Chiang Mai is the largest wat or temple. It was founded in 1345 by King Pa Yo who built a chede which would contain his father's ashes. The main entrance is guarded by two dragon-like lions. You fly domestic flights in Thailand to Chiang Mai with both Thai Airways and Bangkok Airways from Suvarnabhumi. From Bangkok's old Don Muang Airport you can travel with Thai Air Asia. You can purchase and reserve your domestic travel in Thailand from home already.